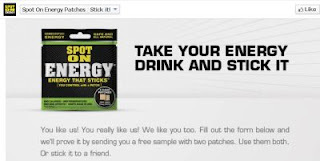 Freedom Rockz: Take your Energy Drink & Stick it! Literally! Take your Energy Drink & Stick it! Literally! Yep that's right they say they are energy patches! This is the fist time I have ever heard of Spot On Energy Patches so I thought I would read up a bit on them. Spot On Energy patches say they are discreet and easy to use. They can be applied and un-applied according to the persons needs. Unlike a product you drink, they say they provide sustained delivery and will not create jitters or cause the user to crash. Because the product is not ingested, it is not necessary to add sugars, preservatives, additives, colors or shelf stabilizers to overcome the inherently bad taste of vitamins or caffeine. This sounds like get idea so I can't wait to get my sample to try them. Like them on Facebook to get a free sample.